Rick Moscati began his career as a geologist for the US EPA in 1990. In 1991 he was hired by the USGS, Branch of Isotope Geology, and then transfered to the Yucca Mountain Project Branch in 1992 to assist with stable isotope studies related to the proposed nuclear repository at Yucca Mountain. Moscati, Richard J.; Premo, Wayne R.; Dewitt, Ed; Wooden, Joseph L.
Moscati, R.J., W.R. Premo, E. H. DeWitt, and J.L. Wooden. 2017. U-Pb ages and geochemistry of zircon from Proterozoic plutons of the Sawatch and Mosquito Ranges, Colorado: Implications for crustal growth of the central Colorado Province. 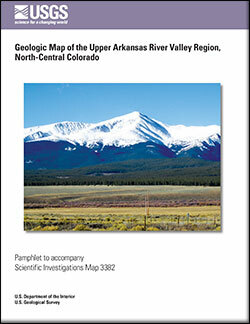 Rocky Mountain Geology, 52:17-106, doi:10.24872/rmgjournal.52.1.17. Moscati, Richard J.; Johnson, Craig A. Major element and oxygen isotope geochemistry of vapour-phase garnet from the Topopah Spring Tuff at Yucca Mountain, Nevada, USA; 2014; Article; Journal; Mineralogical Magazine; Moscati, Richard J.; Johnson, Craig A. Hunt, Andrew G.; Stern, Laura; Pohlman, John W.; Ruppel, Carolyn; Moscati, Richard J.; Landis, Gary P.
Mass fractionation of noble gases in synthetic methane hydrate: Implications for naturally occurring gas hydrate dissociation; 2013; Article; Journal; Chemical Geology; Hunt, Andrew G.; Stern, Laura; Pohlman, John W.; Ruppel, Carolyn; Moscati, Richard J.; Landis, Gary P.
Stuckless, John S.; Marshall, Brian D.; Moscati, Richard J.; Patterson, Gary L.
Hayes, Timothy S.; Landis, Gary P.; Whelan, Joseph F.; Rye, Robert O.; Moscati, Richard J. The Spar Lake strata-Bound Cu-Ag deposit formed across a mixing zone between trapped natural gas and metals-bearing brine; 2012; Article; Journal; Economic Geology; Hayes, Timothy S.; Landis, Gary P.; Whelan, Joseph F.; Rye, Robert O.; Moscati, Richard J.
Moscati, Richard J.; Scofield, Kevin M.
Meteoric precipitation at Yucca Mountain, Nevada: Chemical and stable isotope analyses, 2006-09; 2011; SIR; 2011-5140; Moscati, Richard J.; Scofield, Kevin M.
Hunt, Andrew G.; Pohlman, John; Stern, Laura A.; Ruppel, Carolyn D.; Moscati, Richard J.; Landis, Gary P.; Pinkston, John C.
Hunt, A. G., Pohlman, J., Stern, L.A., Ruppel, C., Moscati, R., Landis, G., and Pinkston, J., 2011, Observations of mass fractionation of noble gases in synthetic methane hydrate. Proceedings of the 7th International Conference on Gas Hydrates (ICGH 2011), Edinburgh, UK., July 2011, Paper 756, 8 pp.